PYEONGCHANG, Gangwon Province -- The North Korean delegation to the PyeongChang Winter Paralympics left the athletes' village here Thursday to return home. 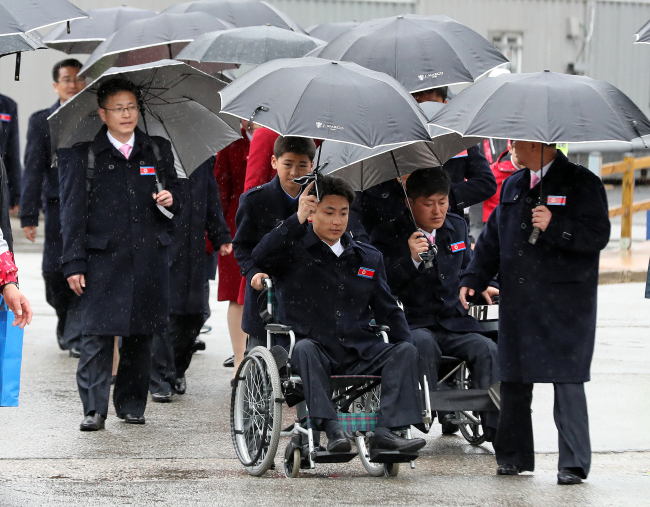 The 24-member delegation, led by Kim Mun-chol, the head of the Korean Federation for the Protection of the Disabled, departed from the athletes' living quarters in PyeongChang, some 180 kilometers east of Seoul, around 9:30 a.m. aboard sedans and a bus prepared by the South Korean government. The North Koreans arrived in South Korea on March 7 via a land route. "You all worked hard to have this event in the divided country," Kim said to Lim Chan-kyu, a South Korean director at the PyeongChang 2018 organizing committee. To reporters, Kim simply said, "see you guys again." North Korea sent six athletes to the first Winter Paralympics in South Korea, but only two -- Ma Yu-chol and Kim Jong-hyon -- competed in the events. The other four came here as observers. Ma and Kim competed in two sitting cross-country skiing events -- 15-kilometer and 1.1-kilometer sprint. They were the bottom two performers among 27 contestants in the 15km, and took 31st and 32nd place, respectively, among 36 competitors in the 1.1km sprint. Although their competition results were not impressive, Ma and Kim made history as they became the first two North Koreans to compete at the Winter Paralympics. Before PyeongChang 2018, North Korea had only appeared at two Summer Paralympics: London 2012 and Rio de Janeiro 2016. Ma and Kim were able to participate in the 12th Winter Paralympics after the International Paralympic Committee gave a special invitation to North Korea. The North Koreans didn't have a joint march with South Koreans at the opening ceremony of the PyeongChang Paralympics last Friday, but they still created a moment of harmony. During the opening ceremony, Ma carried the Paralympic torch with South Korean athlete Choi Bo-gue.